Bank Jawa Barat, or known as Bank BJB has slowly started to become one of the Indonesia people?s bank choice. After their successful to serve west Java people, Bank BJB is now trying to expand their work nation-wide to be able continuing provide the best service in the whole country. Bank BJB was believes to be in the list of 10 largest banks with the best performance in Indonesia. Given trust by Bank bjb to rejuvenate their brand in digital, we realize it is not an easy task to do, it?s a challenge of its own when to rejuvenate a public bank. When a ?Jawa Barat? image in customer?s mind, we try to locate and take out the essential problem and give Bank bjb its new proposition in the market as a national bank. In communicating the brand, we realize that one of the most crucial element in digital communication is, Presence. We start to build Bank bjb presence in digital by using its social media platform to the target market. 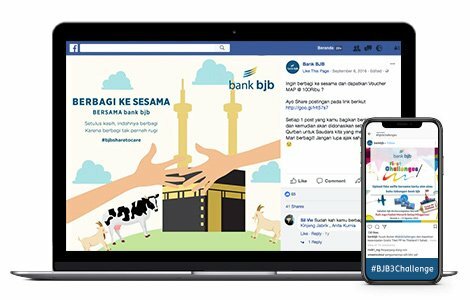 In addition, to build Bank BJB positive image as a fun and friendly Bank, our social media team always active to make interaction and giving a positive response to the any questions or complaints with fun and easy-to-understand language style. In hence, the result is awesome. Many followers uses Bank bjb social media platform to connect & engage with Bank bjb in digital world for any subjects. As for now, Bank bjb digital assets has become one place for customer to interact with Bank bjb, starting from FAQ area up to Customer Service handling sessions. Bank BJB social media account more actively responds to customers when compared with other banks.